To combine your visit to Sri Lanka with one of our Maldives Holiday Packages will provide you with the ultimate vacation experience. Camlo Lanka Tours is specialised in Sri Lanka – Maldives Combination Tours and will handle everything from airport transfers, flight reservations and, of course, all accommodation and transportation arrangements. Guaranteed to be the Best Holiday Experience Ever! For more information about our Sri Lanka – Maldives Combination Tours, please contact us or have a look at our separate Maldives Website. The Maldives – a string of pearls scattered over the deep blue Indian Ocean – The first glimpse you get of this fascinating atoll- formation confirms two unique aspects of the Republic of Maldives. Not only does it consist of the most beautiful tropical islands, but 99% of its 90.000 km² is covered by the sea. 1190 islands are spread over 26 atolls, ringlike coral formations enclosing a lagoon, which gives the Maldives its unique paradise-like appearance. They stretch for about 820 km from North to South, 130 km at the widest point and do not exceed a length of 4.5 miles or an altitude of 6 feet above sea level. No more than 200 islands are inhabited, the rest includes the 87 tourist resorts and uninhabited islands, some of which are used for drying fish or other agricultural activities. 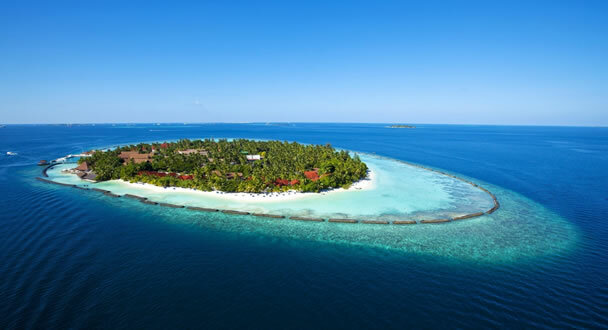 Sun, sand and sea, the thousand ‘Robinson Crusoe’ islands of the Maldives, massive lagoons with different depths and infinite shades of blue and turquoise, dazzling underwater coral gardens; a perfect natural combination for the ideal tropical holiday destination. Camlo Lanka Tours – Your Personal Sri Lanka Tour Operator.